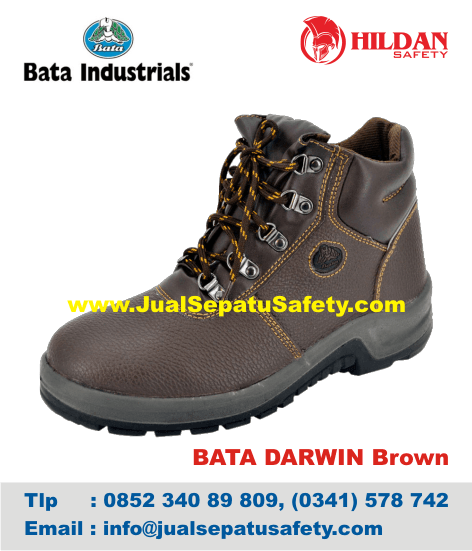 Detail Produk "Sepatu Safety BATA DARWIN brown"
The brown DARWIN 2 shoe is a high model safety shoe ideal for Construction, Logistics, Automotive and Cement industries. The DARWIN 2 is a safety shoe with the S1 safety category. This high model safety shoe features a steel toe cap, an antislip sole, is oil resistant, has a double density outsole and features the Bata Industrials Tunnelsystem®. The DARWIN 2 S1 safety shoe is also available in black. Equator shoes are strong and well-designed safety shoes. These safety shoes are created to provide comfort for your feet. The outsole of Equator safety shoes feature the Bata Tunnelsystem® and is direct injected with double density PU-PU material.